Kiev, Ukraine, June 27, 2018 – GE Power’s Grid Solutions business has been awarded a contract by DTEK, the energy division of Ukraine's largest business group System Capital Management, to supply high-voltage equipment for the 150 kV central power distribution station and two 150/35/10 kV substations, that will capture electricity from the first phase of Primorskaya wind farm (100 MW) located in the Zaporizhia region, Ukraine. The power plant’s commissioning is scheduled for completion in 2019. This is the first project for the deployment of digital substation (DS) technology in the Ukraine. GE’s digital substation technology provides real-time insights about equipment status and automatic response to disruption and failures. This allows the utility to simplify maintenance operations, on a condition-based versus planned mode. The digital substation technology at the heart of the "smart grid" consists of the digital data exchange based on the uniform communication protocol IEC 61850. Unlike conventional substations using analog/discrete signals exchange, the DS technology with digital interaction ensures exceptional reliability and availability of the system. A "dual star" architecture of the substation bus based on the PRP protocol combining all relay protection terminals, interconnection controllers and remote I/O modules (MUs) enhances the reliability of the network. GE MiCOM P546 differential terminals interconnected by fiber optical channels, will protect the cable lines. GE MiCOM P446 relay with a set of remote and current protection will be used as stand-by terminals. For the basic switching equipment for the Primorskaya wind power plant, GE will deploy HYPact solution. HYpact is a hybrid compact switchgear assembly which consists of circuit breakers, disconnectors, and earthing switches. Installation of this equipment enables more economic substation designs and operation, with potential savings in space consumption, preparation planning, transport and at-site installation, switchyard cost and maintenance. Compared to conventional air insulated substations, the maintenance-free periods of substations using HYpact can be tripled or even quadrupled. In addition to savings and efficiencies in space and maintenance, GE’s HYpact solution largely reduces the switchgear’s exposure to environmental influences, providing an economic alternative to gas insulated substations in heavily polluted areas or under extreme weather conditions. “GE is proud to support the exciting digital transformation of Ukraine’s power infrastructure. Incorporating the critical elements of a “smart grid” will enable the country’s power network to reach a new level of reliability and commercial efficiency that will benefit Ukraine’s citizens,” said Gerhard Seyrling, Regional Manager Europe, Russia & CIS at GE Power’s Grid Solutions business. For the construction of the first stage of the Primorskaya wind farm, GE Renewable Energy will also supply 26 wind turbines with a total capacity of 100 MW and carry out their related maintenance. Wind turbines will be delivered to Ukraine and installed at the site of the Primorskaya wind farm in 2018. 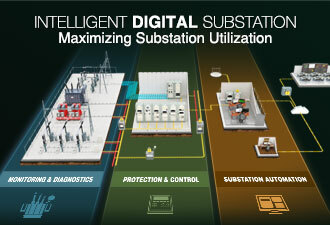 GE has an extensive 20-year experience in the development and implementation of substation automation projects. To date, more than 60 digital substations have been installed worldwide in France, Denmark, Poland, Lithuania, England, USA Mexico and Brazil.